Generations of bird lovers have enjoyed spotting different species in the natural environment and listening for their melodious songs. Today’s camera technology makes it possible to add a new dimension to bird-watching that makes it easier and more memorable. Wingscapes’ Audubon BirdCam takes over for bird-watchers when they head indoors. It’s a motion-activated digital camera, protected inside a weatherproof housing. If you mount it in a tree or near a bird feeder, a motion sensor will automatically take a still picture or a short video (with sound) whenever it detects a bird in its viewing area. If you enjoy watching bird behavior over time, you can create high-definition, time-lapse video with Wingscapes’ TimelapseCam. It takes photos at set intervals and then automatically stitches them together to create time-lapse videos. 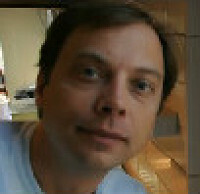 (It also works for documenting parties, plant growth, weather patterns or construction projects.) Come mealtime, Autofeeder makes it easy to regulate how much food is dispensed and at what times. Birds will get used to the routine, which makes it easier for you to watch them. 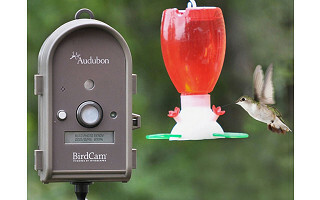 Bart Stephens, the founder of Wingscapes, came up with the idea for the BirdCam and TimelapseCam after experimenting with his digital camera’s time-lapse setting to capture the scene at his family’s backyard bird feeder. By combining motion-activated capabilities, time-lapse photography, and rugged, weatherproof housings, he engineered Wingscapes’ family-friendly bird-watching camera. You can experience backyard nature in a whole new way -- and in vivid detail. Hello Grommetarians! Greetings from beautiful Birmingham, AL, where spring is leaping farther forward every day. We are thrilled to be a part of the Daily Grommet catalog and look forward to sharing our products with you. That is one of the greatest things about our BirdCam,...it makes sharing birds and nature incredibly easy. For us, that means great opportunities to interact with BirdCam users. We love hearing from customers as they experience the up-close, candid look that the BirdCam provides. 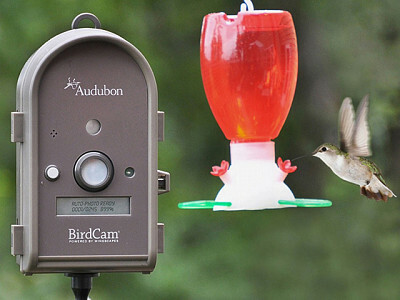 We hear it all the time: the BirdCam helps you “rediscover” your backyard birds. We look forward to answering any questions you have and appreciate this chance to connect with the Daily Grommet community! What a great gift idea for my soon to be 83 year old mother-in-law who loves her birds but is less and less able to see them at the distance of her bird-feeders. We can collect images and video and play it on her wide screen TV. She will be so thrilled to see them up close! Thanks for your comment. The BirdCam has been a big hit with Seniors and, also, with kids. With respect to Seniors, one interesting thing we discovered was that Seniors today are different than they were 10 years ago. Many have been using digital cameras, iPods, etc for years now. The technology is easier to use than many would think. Depending on what you mean as a "senior it's not that they are different today. If you are talking about a senior who was 75 ten years ago, then they'd be 85 now. And for seniors, that a huge leap. So current seniors (60+ have been using computers for at least 20 years. I have a friend who is 84..she use to tell me how at her sons house she had a beautiful bedroom with a picture window view of the birds..her home was on Whidbey Island in the San Juans. She had been an oil painter..an accomplished one. She would tell me how she spent her days watching the birds and enjoying it so. So I will keep the cam idea in my reservoir of ideas for any bird watching in the future. Generations of bird lovers have enjoyed spotting different species in the natural environment and listening for their melodious songs. Today’s camera technology makes it possible to add a new dimension to bird-watching that makes it easier and more memorable. Wingscapes’ Audubon BirdCam takes over for bird-watchers when they head indoors. It’s a motion-activated digital camera, protected inside a weatherproof housing. If you mount it in a tree or near a bird feeder, a motion sensor will automatically take a still picture or a short video (with sound) whenever it detects a bird in its viewing area. If you enjoy watching bird behavior over time, you can create high-definition, time-lapse video with Wingscapes’ TimelapseCam. It takes photos at set intervals and then automatically stitches them together to create time-lapse videos. (It also works for documenting parties, plant growth, weather patterns or construction projects.) Come mealtime, Autofeeder makes it easy to regulate how much food is dispensed and at what times. Birds will get used to the routine, which makes it easier for you to watch them.